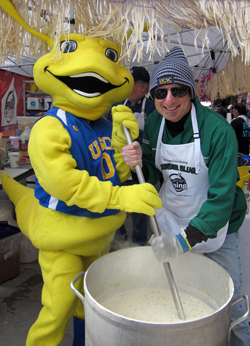 Sammy Slug and Scott Berlin, UC Santa Cruz director of dining and hospitality services, stir a winning batch of New England clam chowder. From left, the Redwood Sluggers team of Danielle Vaden, Fernando Luis, Dennis Wake, and student Devon Vandergon, won first place People's Choice award for its Manhattan chowder. A record 85 teams from along the west coast competed on a cold and blustery day in three divisions: individual, corporate/media, and restaurant. When the final results were tallied, two UC Santa Cruz Dining teams captured first place awards. 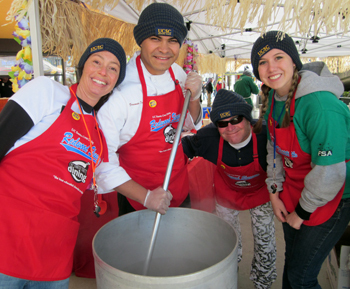 Cooking up a spicy Manhattan (red) chowder, the Redwood Sluggers team won the first place People's Choice Award. The winning recipe was prepared by Fernando Luis, Dennis Wake, Danielle Vaden, and student Devon Vandergon. The Chowder Slugs team, serving a smooth and tasty New England style (white) Chowder took the first place Most Tasted Award. Dwight Collins, Yrene Marquez, and Dining Services Director Scott Berlin prepared the winning recipe. More than 50 gallons were prepared in less than two hours. Traci Takeuchi coordinated chowder team logistics.